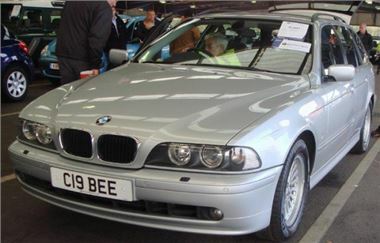 This 2001 BMW 530i SE Touring auto was a lot of car for £3,300, but it had done 171k miles. An 85k mile 03 reg KIA Sorento that hadn’t sold at its last couple of appearances went for £6,600, which looked cheap but, mileage adjusted, the book said £5,900. A 2003/52 Focus ST170 was dear at £4,800, but a 99V 1.8LX was more like it at £1,550. A 2001/51 MG ZS 180 was definitely a lot of car for £2,900, though, and the chilly weather meant an 04 MINI Cooper convertible was the cheapest I’ve ever seen at £8,400, never mind the miles. Private buyers seem to go crazy for low mileage Yaris yet miss the more sensible buys. A 14k mile Y reg 1.0GS 5-dr sold for a plain silly £3,200, while a much more useful 27k mile Y reg 1.3 GS Verso went for only £2,550 and an admittedly high 95k miles 2002/52 Corolla Verso 1.8 sold for £2,650. A 94M LandRover Defender County SWB 7-seater TD5 held up the way LandRovers do to sell for a strong £5,600. But the auctioneers (rightly) wanted more than the £1,000 bid for a lovely 101k mile 94M Mercedes E280. Better get down there on Friday if you want the car.